The Squaw Spring Trail is a lesser known route to the top of 7848 foot Pinal Peak, up the eastern side of the mountain. There are great views and beautiful forest along this hike. Beginning at the Pioneer Pass Trailhead at the head of Pinal Creek, begin following the signed Squaw Spring Trail #196 up an old jeep road as it climbs away from the west side of Pioneer Pass. The road soon turns into an easily followed trail as it turns west to climb the ridge up to Pinal Peak. The first of many gambel oak tree groves begin to appear along here, as the trail continues its steady climb. After about a half mile, the trail turns north, and passes through some thickets of tall manzanita. There are some great views of the long ridge known as East Mountain, the San Carlos Apache Reservation, and the Dripping Springs Mountains through the forest of ponderosa, gambel oak, and new mexican locust. As the trail climbs higher, gambel oaks become the predominant tree. At the 7000 foot level, there are some small rocky mountain maple trees along the trail, and a couple larger ones are in the ravine to the north. A knee-high, fern-like groundcover begins to appear here, and will carpet the mountainsides along the trail for the rest of the way to the peak. Once the trail reaches the 7200 foot saddle, the climb eases up for a short ways, before the last push to the summit. Continuing upward through a pine/fir forest you will soon come to the site of Squaw Spring and its series of black plastic water pipes, all of which is behind barbed wire and chain link fencing (probably to keep the cows out). I saw a little bit of stagnant water in a metal tub next to the trail. 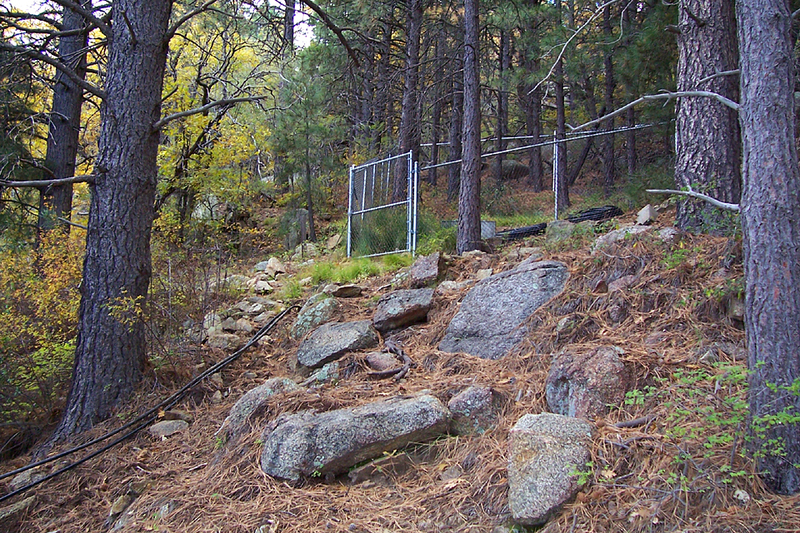 Be careful not to lose the trail here among the myriad of game trails (the Squaw Spring Trail stays south of the fenced area). Shortly past the spring, the switchbacks end, and the trail passes through a cattle gate. You're almost there. Just continue to follow the trail as it gently climbs a shallow, forested gulch. Soon the trail arrives at a meadow, and the radio towers come into view. The Squaw Spring Trail comes to an end at forest road 651, near the large dirt parking lot of the Pinal Peak Trailhead. The top of this sky island yields great views, and a few alpine fir trees among the gambel oaks. 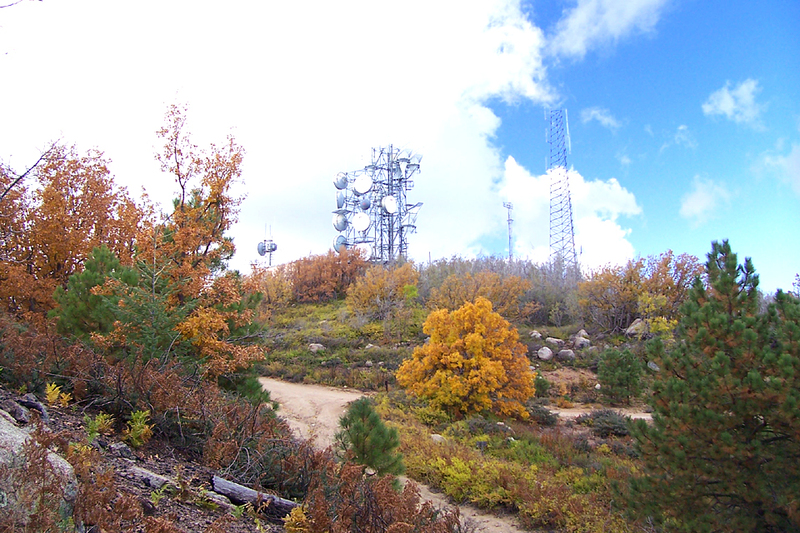 It is just a short walk to the official top of Pinal Peak (the radio towers directly in front of you). Return the way you came, and enjoy the views on the way down! From the highway 60/highway 188 junction in Globe, head east on hwy 60 for 2.9 miles. Turn left onto Broad Street at the stoplight. Follow Broad Street for 1.1 miles, then turn right at the fork, where you will immediately cross railroad tracks and a bridge (this becomes Six-Shooter Road). Follow Sixshooter Road for 0.9 miles, then turn right onto Icehouse Canyon road. After 1.75 miles on Icehouse Canyon Road, Kellner Canyon Road splits to the right. Stay left, and follow the road another 8.25 miles to Pioneer Pass (the site of Pioneer Pass Trailhead, 10.0 miles from Sixshooter Road).